I think it’s time to take a break from all the savory dishes that Kanwal’s Healthy Corner has to offer, and shift towards light, sweet dishes. Especially since the holidays are right around the corner, this is the perfect time to introduce light and healthy desserts! 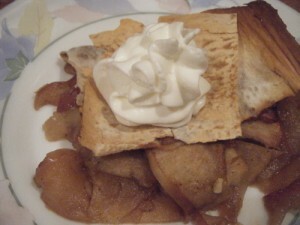 One of my favorites…apple pie! Yes, the smell of freshly baked apple pie, with the perfect amount of sweetness, can be the perfect comfort food! Also, not all apple pie can be bad for you. 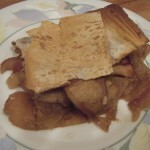 Follow my recipe below for a low fat and low sugar apple pie. 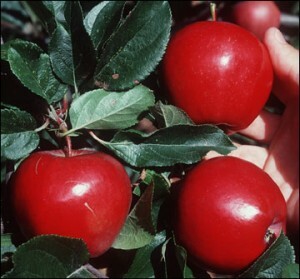 An added bonus, leave the skin on the apples and cut them really thin, you will get added fiber and a great texture to your pie! In a bowl, combine the apples, brown sugar and corn starch. Lightly spray a 6 inch pie bowl, add three sheets of phyllo dough on the bottom. Carefully align the apple slices in the pie bowl. Top with the remaining three sheets of phyllo dough, and spray with a canola spray. Bake in the oven for 45 minutes to an hour, or until the crust has turned a light brown. Allow to cool and enjoy with a dollop of whip cream or vanilla ice cream. If you would like to have a recipe revamped or have any questions, please email Kanwal at kanwal.ullah@gmail.com. Or you can post comments here and I’ll check in from time to time… You never know, your next question could be featured on next week’s column for The Ajnabee! This entry was posted on Wednesday, November 11th, 2009 at 9:28 am and is filed under Recipes.